This popular Half Day Tour at Pearl Harbor also includes lunch! You pay just $34.50 for an adult, saves $10.00 on each adult tour. 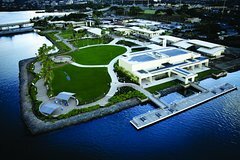 The Pearl Harbor Visitor Center Deluxe Tour is a popular Half Day Tour that includes lunch! • A USS Arizona Memorial Narrated Tour- National Park Service’s official tour of the Pearl Harbor Visitor Center and the USS Arizona This self-guided two hour audio tour takes you and your family through our two world class museums, provides narration on the USS Arizona Memorial, then along the shoreline for the incredible " Path of Attack" Tour. Available in English, French, German, Spanish, Japanese, Korean, Russian, Italian and Mandarin. • Admission to the USS Bowfin Submarine Museum & Park. An awesome self-guided audio tour that includes; the USS Bowfin Submarine Tour and the Submarine Museum tour on “The History of Undersea Warfare”. Available in English, Japanese, Korean, Mandarin, German, French, and Spanish. • This great tour also includes admission to the National Park Services’ new Pearl Harbor Virtual Reality Center to view “Witness the Attack on Battleship Row”, “Walk the Deck of the USS Arizona Before the Attack” and “Experience the USS Arizona Memorial”. Three awesome VR Tours you will never forget. • This program does not include the movie/boat tickets to the USS Arizona Please visit the National Park Service website at recreation.gov (Toll free US/ Canada 1-877-444-6777), tickets are available two months out and are only $1.50 each. Or come early, each day there are an additional 1,300 free tickets given out at the Pearl Harbor Visitor Center on a first come, first serviced basis; gates opens at 7am. • For safety reasons, kids under 4 years of age are not allowed on the submarine. • USS Bowfin Submarine is not wheelchair accessible.